Have you noticed if your walls our bowing, leaning, or have you seen wall cracks? If so, these are all signs of foundation problems. Atlas Piers in the Atlanta area uses only the best products manufactured by the leading manufacturing company of piers in the industry, Earth Contact Products. Some of the options are helical piers, resistance piers, or a helical tieback system. The helical tieback system allows for a capacity of up to 200,000 pounds per anchor. Atlas Piers has the professionals to find the solution to your bowing walls Atlanta needs. The Atlanta area is known to get a lot of rain at times. Excess water in the soil around the foundation of your home can cause hydrostatic pressure which in turn, causes the foundation walls to lean. 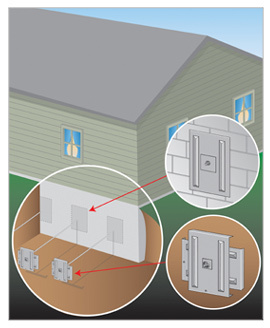 If you notice your foundation walls are leaning, call the professionals at Atlas Piers to find the best solution. Our resistance piers are helpful for this problem. For the safety of you and your family, let Atlas Piers check out why you have leaning walls, and offer you a solution to your leaning walls Atlanta problem. We install the most reliable engineered products. If you have noticed cracks in your walls, then it’s probably a good idea to also check forsticking doors and windows, sloping floors, and cracks in slabs or porches. Along with cracks in your walls, and any of these other signs, it’s a good idea to call Atlas Piers of Atlanta and get one of our professionals out to take a look at your foundation. The longer you wait to get these problems looked at, the costlier it will be in the long run to fix the problem. We are here to help. 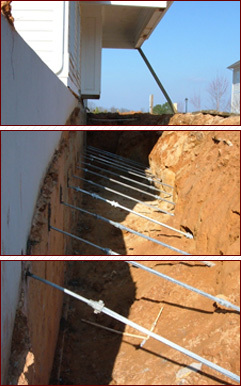 Contact us and let us examine your foundation and give you the best solution to your wall cracks Atlanta problem.